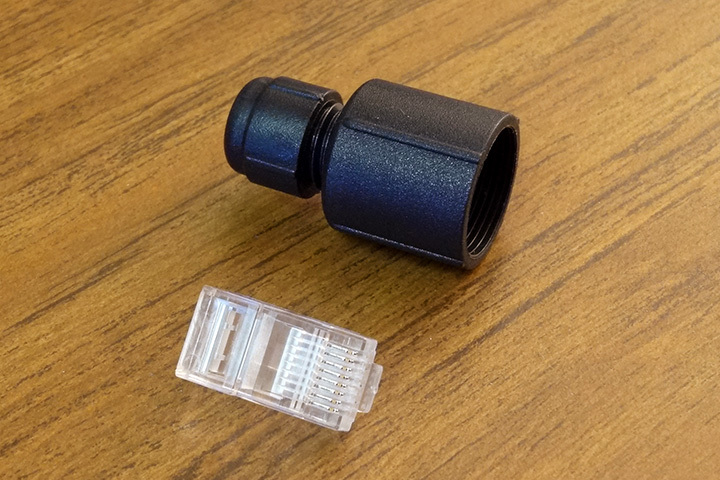 Our waterproof threaded connectors are IP66 rated to allow you to make unprotected outdoor connections without worrying about damage or shorts. Use these connectors when making your own camera cables with bulk cable. Pack of five. Includes loose cable boots and RJ45 connectors. Does not include cat5e cable. Requires an RJ45 crimping tool, not included. Compatible with HD40IR. HD40D, HD80IRM, HD810, and HD90IRH cameras with threaded dongle. Note: Not compatible with HD420, HD820, HD30, HD300, HD510, HD90 or Rev A camera revisions without threaded dongle.